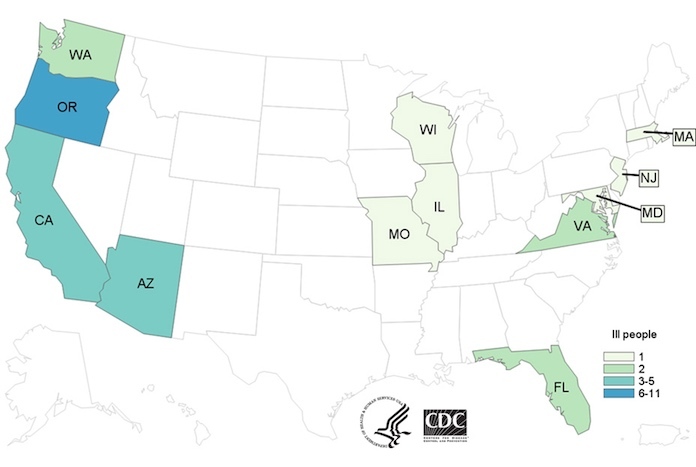 The E. coli O157:H7-HUS outbreak linked to recalled I.M. Healthy SoyNut Butter products is over, according to the Centers for Disease Control and Prevention (CDC), after sickening 32 people in 12 states. Twelve people were hospitalized in this outbreak, and nine developed hemolytic uremic syndrome (HUS), a type of kidney failure. Public health officials think that people may still have these recalled products in their home, so illnesses may “continue for some time.” The CDC recommends that consumers do not eat, and childcare centers, schools, and other institutions do not serve, any of the recalled products, even if part of the product was consumed and no one got sick. Twenty-six, or 81%, of the patients in this outbreak were under the age of 18. The products were served at schools and daycare centers because they were a substitute for peanut butter. Patients live in Washington state, Oregon, California, Arizona, Florida, Missouri, Illinois, Wisconsin, Virginia, Maryland, New Jersey, and Massachusetts. Illnesses started on dates ranging form January 4, 2017 to April 18, 2017. Patients ranged in age from 1 to 70 years, with a median age of 9. Among the patients, 59% were male. No deaths were reported in this outbreak. 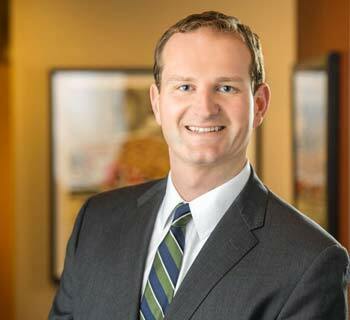 Attorney Ryan Osterholm said, “E. coli-HUS can cause years of painful medical problems.” You can contact him at the renowned law firm Pritzker Hageman by calling 1-888-377-8900. Public health investigators used the PulseNet system to identify illnesses that were part of this outbreak. Whole genome sequencing (WGS) performed on isolates taken from ill persons showed they were closely related genetically, providing more evidence that those sickened in this outbreak got sick from a common source. In interviews, patients or their families answered questions about the foods they ate and the places they visited the week before they got sick. Twenty-five (78%) of the 32 people interviewed reported eating I.M. Healthy brand SoyNut Butter at home, attended a facility that served the product, or attended childcare centers that served it the week before their illnesses started. Then, the product was tested. Lab testing identified STEC O157:H7 in opened containers of I.M. Healthy SoyNut Butter taken from the homes of ill people in California, Oregon, and Washington state. California public health officials found STEC O157:H7 in unopened containers of I.M. healthy brand SoyNut Butter taken from retail stores. Whole genome sequencing showed that the bacteria in all of these containers were closely related genetically to isolates from the patients. All I.M. Healthy SoyNut Butters and all varieties of I.M. Healthy Granola products were recalled as a result of this outbreak. In addition, Dixie Diner’s Club brand Carb Not Beanit Butter was recalled, as was 20/20 Lifestyle Yogurt Peanut Crunch Bars. Check to see if you have those products in your home. If you do, throw them away in a sealed container. The company that produced the soy paste used in these products, Dixie Dew Products, was closed by the FDA after federal inspectors found serious food safety issues. In that facility, forklifts were operating inside and outside for waste disposal, and were never cleaned. There was no control of employee foot traffic in and out of the processing room. And the hot water tank for handwashing sinks was “out of repair” for two years. The symptoms of an E. coli infection include severe and painful abdominal cramps, a mild fever, and diarrhea that may be bloody and/or watery. In young children, and in people who are improperly treated with antibiotics, this infection can develop into hemolytic uremic syndrome (HUS), which causes kidney failure. The symptoms of HUS include little urine output, lethargy, pale skin, easy bruising, a skin rash, and bleeding from the nose or mouth. Anyone experiencing these symptoms should see a doctor immediately. If you or a loved one ate any I.M. Healthy SoyNut Butter product and have been diagnosed with an E. coli infection and/or HUS, contact our experienced legal team for help. America’s food safety law firm, Pritzker Hageman, is one of very few in the country that specializes in helping those harmed by adulterated food products in outbreaks throughout the United States. Its lawyers have won hundreds of millions of dollars for foodborne illness patients and their families, including the largest verdict in American history for a person harmed byE. coli and hemolytic uremic syndrome. The firm also publishes Food Poisoning Bulletin, a Google news site, that is a respected source for food safety news and information. Pritzker Hageman lawyers are regularly interviewed by major news outlets such as the New York Times, CNN, and the Wall Street Journal. In addition, the firm represents people harmed by pathogenic bacteria in Legionnaires‘ disease, surgical site infections, and product liability cases.